A young environmental activist, who refers to herself as Warbler, is tree-sitting in Mendocino County in an attempt to block the planned expansion of Highway 101 in the town of Willits. 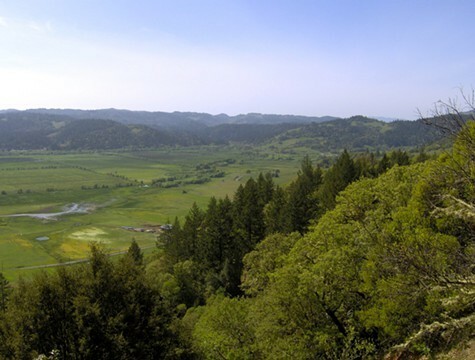 The proposed expansion by Caltrans would destroy a picturesque wetlands area, kill numerous native oak trees in the area, and disrupt two key salmon runs. Several environmental groups have sued to stop the proposed freeway expansion. It’s one of two Caltrans projects along the North Coast that environmentalists are fiercely opposing. The other is the planned widening of Highway 101 in Richardson Grove State Park near a large stand of old-growth redwoods. Caltrans has been under pressure from the trucking industry and corporations that do business along the North Coast to widen Highway 101, the major thruway in the area, to make it easier for big rigs to use. Environmental groups contend that the plan is turn Highway 101 into another I-5. In preparation for the Willits construction, Caltrans plans to cut limbs off of oak trees and top them in order to discourage migratory birds, including yellow-breasted warblers, from nesting. Once construction begins, Caltrans will then chop down the trees. The $210 million expansion also includes the construction of a mile-long, 30-foot-high viaduct across the wetlands of Little Lake Valley. Caltrans plans to drain the wetlands during construction, clear-cut oak trees, and bulldoze hillsides to use for fill. The state agency also plans to “relocate” Coho salmon from Outlet and Bechtel creeks, two important salmon runs on the North Coast. Environmentalists worry that the relocation will endanger the salmon over the longterm. Warbler has been tree-sitting in the path of the Willits construction since January 28. Updated: June 5 Primary Election Results! Results for select East Bay and statewide races and measures.